Bitcoin History, Self-Sovereign Identity, Blockchain Development, and Web-Tech. torange.biz CCA 4.0 International License. My Goal: Create a reasonably comprehensive index for the ecosystem of information surrounding Bitcoin, Blockchain, and Cryptocurrency. A portfolio of research and content I’ve created over the past year. Hooray! I created this website at the beginning of the year, which was my first time learning how to publish a web-page… even if it was only a couple clicks, and a few paragraphs to start with. I’m primarily interested in Bitcoin, decentralized identity, blockchain, cryptocurrencies, programming, and i’ve studied data science quite a bit. Having gathered information on a variety of subjects into github repositories, I began learning how to publish with GitHub Pages. I aim to create content of the highest quality - relating complex subjects in a clear and concise fashion - supplying essential details, with quality sources for further study. I’m fascinated by all the history surrounding Bitcoin, and tech generally, but especially any aspects that directly relate to Bitcoin in some fashion. I’ve found it easier to understand blockchain and cryptocurrency, going back over their histories… cryptography, one-way hash functions, public key encryption… Important to recall is that state supression of cryptography is the #1 cause of blockchain mania. It took Bitcoin to get governments to go along with crypto-innovations, for the public anyhow. From the beginning of the digital age, industry was discouraged from becoming too creative with cryptography. For example, in the US and allied nations, there were strict export controls on encryption unless the government could crack it. Now Bitcoin has forced the hand of industry and the state, to try and catch up with the cypherpunk tech. /bahamas-crypto —Blockchain in the Bahamas. Over the past year, a number of different clients hired me to write about decentralized identity. One client had me write higher level (but technically precise, and exhaustive) introductary pieces for developers, to be included as part of their training courses for various hyperledger and other blockchain training. So I decided to start making this resource. Decentralized-ID has become a passion. This is my most highly developed research project, to-date. The rise of Bitcoin has brought new life to the quest for a decentralized - vendor agnostic - identity layer for the internet, that began around the early 2000’s. Today, we are closer than ever to a sensible approach to identity online. As far as I can tell, this is blockchain’s breakthrough application, beyond currency. Efforts to create a decentralized identity layer for the internet have persevered since the early 2000’s, experiencing surge of energy with the rise of Bitcoin, the GDPR, and the United Nations Sustainable Development Goals for all to have legal id by 2030. Plus.. Canadian governments are using a distributed ledger for their business registry, which will support a ton of useful technologies!!!! 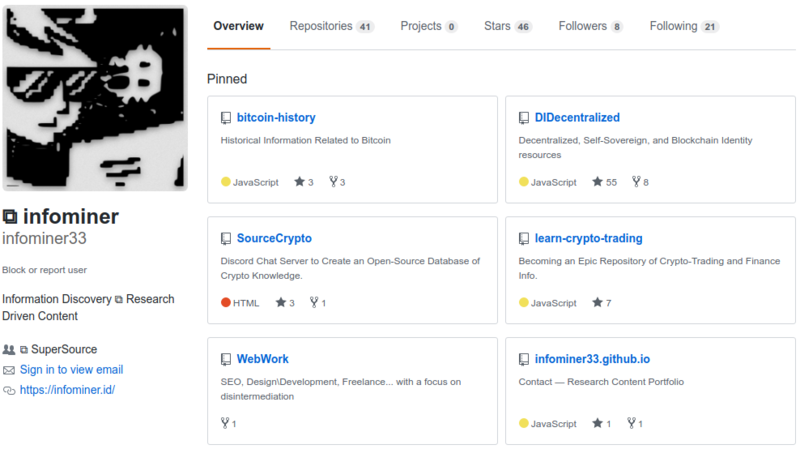 infominer.id/DIDecentralized —Epic repository of DID and SSI Resources. Yay! so you can see created DIDecentralized (formerly named /awesome-decentralized-id) was created on November 11, 2019. That’s also when I began learning to use GitHub, and Git. Trading \ technical analysis is the subject I’ve studied the least, of almost anything, but this is my fastest growing repository (in followers) besides DIDecentralized (surprise surprise). My digital transformation tour-guide said that means it should have a heading here. Jokes aside, I do plan to study more, and build out that site. Actually, I’ve hatched some cool plans to make it awesome! Chart Patterns - Notes taken accompanied by the Encyclopedia of Chart patterns by Thomas Bulkowski. SEO Simplified! Increase your Rankings 2019! I follow cryptographers, developers, academics, cypherpunks, maximalists, generalists, enterprise, traders, etc. — re-tweeting valuable information to collect, organize, and catalog in the 100+ channels of Source⧉Crypto Discord Chat. I’ve gradually been figuring out the best ways to structure that data, generate pages with it, and create dynamic resources that are fine-tuned to the users research needs. This is just the beginning of what will become an epic repository of knowledge. I offer content creation, research consulting, and web publishing services. In-depth research is time-consuming. In crypto, the matter is made even more challenging because of the vast amount of domain knowledge required to obtain quality results. What I lack in experience, I make up for with relentless search habits. I ask questions to ensure I understand what my clients need, commonly checking in to show my progress and ensure I’m providing value. I have a passion for learning, enjoy crypto-related research, and would love to help with your research needs. I’m experienced at writing on subjects that I previously knew little about. My primary focus is education, simplicity, and accuracy. I’m not a fast writer. I enjoy writing high-level overviews of blockchain platforms that can serve as an introduction to developers. ISO clients who want Bitcoin-related content for their websites. One project I’m hoping to find a buyer for is a series of articles on the history leading to Bitcoin. It’s rather simple to set up a site, via github, but there are a number of tweaks that really make your site, such as, having proper metadata so that your preview text\image show up on various platforms. Once its all set up, it will be easy for you to just add blog posts formatted in markdown. Whatever you’re interested in… I’m already maintaining 5 of my own sites.. I don’t see any harm in adding one more to the mix. Perhaps you have an old site and you want it migrated, or want help with your existing github pages site… who knows really. Just connect with me and we can discuss your needs. I love to Earn Bitcoin working with kind folk such as yourself. More than a job, I’d love to generate an income by creating resources such as found on this site. Feel free to send a donation and support the cause.